Fruits are very nutritious, thanks to their high vitamin, mineral & antioxidant content. Because of this, they bring many health benefits to one’s health. Eating them can also be beneficial for weight loss. To lose weight, you need to create a calorie deficit, which is achieved by consuming fewer calories than you burn. When you do this, your body is forced to burn its fat stores for energy. Eating water & fiber rich foods like fruits & vegetables can help you to reduce your caloric intake, whilst ensuring that you don’t become nutrient deficient. As a general guideline, aim to eat around 2 or 3 servings of fruit per day. The more active you are, the more fruit you can eat. If you are diabetic or extremely obese, speak to your doctor first so that he or she can advise you on how much fruit you should be eating. In this article I will list out some of the best fruits to eat for weight loss. Berries are not only delicious, they are also some of the healthiest foods on the planet. One reason for this is because they have the highest antioxidant activity among common fruits. This means that they are very effective at reducing damage caused by free radicals in our body, thereby protecting us from a number of diseases. Berries are also low in calories & sugar but high in dietary fiber. For example, a cup of raspberries has 64 calories, 5 g of sugar and 8 g of fiber. This study found that by making a simple change and upping fiber consumption, you can drastically help your weight loss efforts. This is thought to be because fiber slows down the movement of food through the digestive system and increases feelings of fullness. Eating a cup of berries will definitely help you to increase your overall intake of fiber. Aim to eat a variety of berries, including strawberries, blueberries, raspberries and blackberries. You can eat them on their own, add them to Greek yogurt, oatmeal & cottage cheese or include them in salads. Melons have large amounts of water. For example, the aptly named watermelon is made up of more than 90 percent water, and since water has 0 calories, a cup of watermelon only has 46 calories. This makes it a great weight loss fruit, together with cantaloupe and honeydew melon, which are also low in calories. A lot of people are chronically dehydrated and tend to mistake thirst for hunger. They therefore reach out for some food rather than a glass of water. The great thing is that you can eat some of your water by consuming water-rich foods likes melons. Doing so reduces the chances of you becoming dehydrated. You may be worried about the sugar content of melons, but so long as you eat them in moderation, they are perfectly fine. Eating a cup of watermelon will provide you with 9 g of sugar, and this is nothing to be concerned about. On the other hand, eating half a melon will provide you with 140 g of sugar, which definitely isn’t a good idea. Like with all other things in nutrition, moderation is key. Despite the fact that avocados are extremely healthy, you may be surprised to see them included in this list because it is well known that they are high in fat and calories. However the truth is that so long as they are eaten in small amounts, avocados may help you to lose weight. 26 healthy overweight adults took part in this study and ate one of 3 lunch test meals. The first meal was avocado free, the second was avocado inclusive and the third was avocado added. The people who ate avocado felt 23% more satisfied and had a 28% lower desire to eat over the next few hours. Even though avocados are calorie dense, their high satiety may help you to eat fewer calories throughout the day. What is important is to make sure that you don’t eat too much. Depending on your caloric requirements, you should be fine to eat between half and a full avocado a day. A great example of a very filling breakfast that provides you with all 3 macro-nutrients is two large boiled eggs (high quality protein), half an avocado (healthy monounsaturated fat) and a cup of oatmeal cooked in water (complex carbs). This breakfast contains approximately 480 calories and will keep you satisfied until lunch time. The grapefruit diet (also known as the Hollywood diet) is a fad diet that has been around for decades. Dieters are expected to consume fewer than 1000 calories per day and every meal needs to be accompanied with grapefruit or grapefruit juice. Whilst we’re not suggesting that you have to follow this diet yourself, grapefruit may have some weight loss benefits. In this study, 91 obese individuals consumed either placebo capsules with apple juice, grapefruit capsules with apple juice, placebo capsules with grapefruit juice or half a fresh grapefruit with a placebo capsule. They did this 3 times a day before each meal. After 12 weeks the fresh grapefruit group had lost 1.6 kg, the grapefruit juice group had lost 1.5 kg, the grapefruit capsule group had lost 1.1 kg and the placebo group had lost 0.3 kg. The study concluded by saying that although the exact mechanism of this weight loss was unknown, including grapefruit in a weight reduction diet would appear reasonable. It is important to keep in mind that grapefruit is not the easiest of fruits to enjoy eating because it tastes very tart. If you can’t handle it on its own, eat it together with other sweeter tasting fruits such as oranges and apples. Apples and pears are quite similar. A medium sized piece of each fruit has roughly 100 calories and provides you with 4 – 6 g of fiber. Combined with their high sugar and water content, these two fruits taste great and are filling. Apples and pears have been studied to determine how their consumption may affect one’s weight, and they have both shown promising results. In this study, participants ate apple slices, applesauce, apple juice or no apple products, before a meal. Those who ate the apple slices felt fuller than those who consumed the other foods. They also ate fewer calories. This suggests that eating solid fruit is a better option for weight loss compared to consuming it in another form. In another study, 49 women were randomly chosen to add three apples, three pears or three oat cookies to their usual diet for 10 weeks. The fruit and cookies had the same amount of fiber and total calories. The apples and pears group lost 0.93 kg and 0.84 kg respectively, whereas the weight of the oat group remained unchanged. These fruits are great to snack on in between meals. They can be eaten on their own or sliced up and dipped in almond butter or hummus. Tropical fruits are some of the best sources of vitamins A & C, both of which are needed for a multitude of bodily processes. Vitamin A keeps your eyes, hair and skin healthy, whilst vitamin C assists with iron absorption and is needed for wound healing. These fruits are also very sweet tasting, thanks to their high sugar content. This can come in handy, especially if you have a sweet tooth. When trying to lose weight, the urge to resist sugary foods like ice cream and sugary desserts can be very difficult. Eating a cup of fruit can help to provide a fix for the sugar craving. A half cup serving of ice cream has 137 calories, 7 g of fat and 14 g of sugar, but very few vitamins & minerals. Half a cup of mango has 54 calories, 0 g of fat, 12 g of sugar and large amounts of vitamins & minerals. The fiber in the mango will also keep you satisfied for longer. If you are fan of after meal desserts, you can make your own healthy fruit based sorbets, popsicles and puddings using fruit as the main or only ingredient. A study was carried out in 1995 where subjects were fed 240 calorie portions of 38 different foods from six food categories, one of them being fruit. They then described how satisfied they felt after eating the foods. Using white bread as a baseline with a ranking of 100, the 38 other foods were each given a ranking score. Foods that scored higher than 100 were more satisfying than white bread and those that scored under 100 were less satisfying. 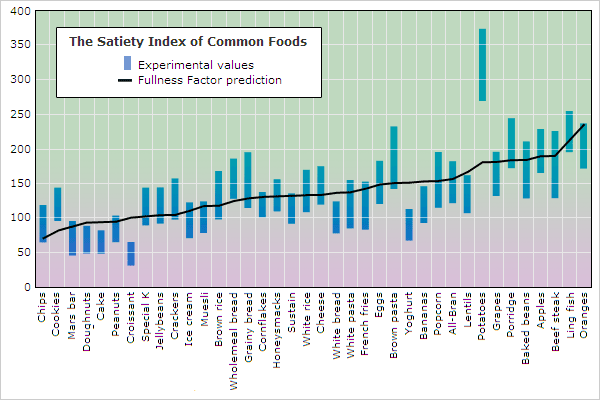 This gave rise to the Satiety Index, a way of measuring how satisfying a food is. Oranges and grapes ranked high on the satiety index. The reason for this is because of the low caloric value of these foods. In the linked diagram, cake ranked lower than white bread, whereas oranges ranked higher. This makes sense; 1 piece (64 g) of chocolate cake has 235 calories, so you can eat slightly more than one piece to reach 240 calories. On the other hand, a large orange has 86 calories so you can eat almost 3 of them to reach 240 calories. It is important to keep in mind that an orange and a glass of orange juice that have an equal amount of calories are not equally filling. The solid orange will be much more filling than the juice will be, as was seen in the apple study. Fruit juice tends to be high in sugar & calories but low in fiber, which is why it should only be drunk occasionally, especially when trying to lose weight. Eating solid fruit is the best option. Before they become fully ripe, bananas are high in resistant starch. Once they ripen, they contain mostly sugars. As the name suggests, resistant starch is resistant to digestion. It functions like soluble fiber and travels through the stomach and small intestine undigested. It then feeds the friendly bacteria found in the intestine. Because resistant starch has 2 calories per gram whereas ordinary starch has 4, foods high in resistant starch tend to be lower in calories. Studies have also found that resistant starch has a strong impact on satiety and reduces food intake. It may also lead to increased fat burning. Green bananas are slightly bitter and not as sweet tasting as ripe yellow bananas. For this reason, you may want to combine the two and eat them together. Keep in mind that this doesn’t mean that ripe yellow bananas eaten on their own are bad for weight loss. Whilst they don’t rank as high on the Satiety Index as oranges & apples, they do have good amounts of fiber and are a great energy boosting snack to have. Drupes (fruits that have a stone in the middle) are fiber rich and fairly low in calories. Examples include peaches, apricots, plums and cherries. A medium sized peach has 59 calories & 2 g of fiber, and an apricot has 17 calories & 1 g of fiber. These fleshy fruits should not be confused for their dry counterparts, which are much higher in sugar and calories. A cup of prunes (dried plums) for example, has 418 calories & 66 g of sugar. By comparison, a cup of raw plums has 76 calories & 16 g of sugar. Because of the large amounts of sugar found in dried fruit, it is very easy to overindulge. You do not need to avoid dried fruit completely but be sure to control the amount that you eat. For example, eating 2 or 3 dates a day is fine, but eating a whole cup won’t do your waistline any favours. There are lots of choices when it comes to fruits that you can eat for weight loss. Eating 2 or 3 pieces of fiber rich fleshy fruit will keep you satisfied and energized throughout the day.